In the same way as Acting as Play, Gabe's coaching philosophy was built primarily on the shoulders of Christopher Bayes (Master Clown teacher, and Head of Movement at the Yale School of Drama), Evan Yionoulis (current Head of Drama, Juilliard) and Ron Van Lieu (Former Head of Drama NYU, YSD, and current Professor of Professional Practice at Columbia). With all of that in play, Gabe will work with you on whatever aspect of your work/career with which you are struggling and/or looking to deepen, with a special focus on audition prep, monologue prep for graduate and undergraduate applicants, and solo show development. Hourly rate quoted upon request. ‘Tis the season after all, and the primary focus of Gabe’s coaching practice during the fall! Gabe will meet you wherever you happen to be in the process. Whether its helping to find the right monologues, or strategies to stay relaxed and focus while keeping the fun alive on the day of the auditions, Gabe will be there for as much of the process as benefits you. Over the last 2 years Gabe has successfully assisted multiple individuals get accepted into Yale School of Drama, Brown, The Pig Iron School and RADA. And actors he’s coached have had final callbacks and/or been waitlisted at Columbia, NYU and Juilliard! Gabriel Levey is an actor, theatre maker, and teaching artist with an MFA in Acting from the Yale School of Drama, and a BFA in Acting from Boston University. 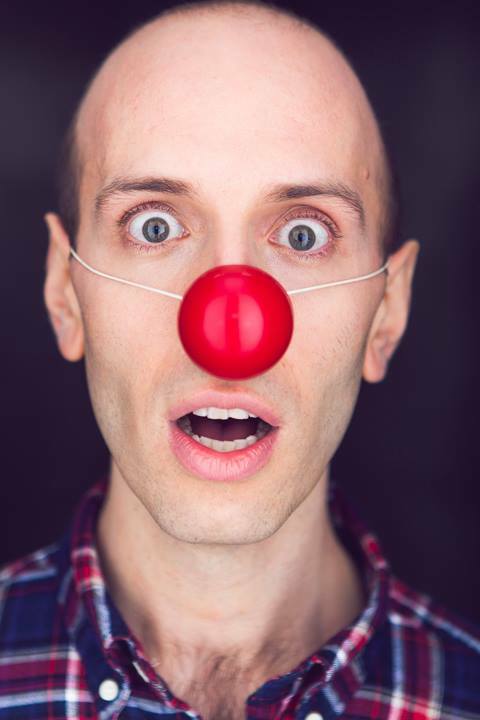 After graduating from the Yale School of Drama, Gabriel continued to work with his mentor Christopher Bayes as a teacher trainee in Clown and Commedia Dell’arte. Now, as a fulltime faculty member of Chris’ Funny School of Good Acting, Gabe teaches Shakespeare/Clown in The Funny School’s Summer Extravaganza, and Acting as Play – a hybrid clown and scene study class - every Sunday night. Gabe has also recently joined the faculty of The New Studio Broadway at NYU Tisch, continuing to explore the work he's been developing in Acting as Play, with particular focus on Shakespeare. Additional teaching experience includes multiple Clown workshops with company members from Gallim Dance, Clown at Stella Adler, a semester of Commedia Dell'arte and a semester of Chekhov at PPAS (The Professional Performing Arts High School), Scene Study and Games at the Yale Summer Acting Conservatory, Games and Improv at Shakespeare and Company in Lenox, MA. As a coach Gabe has successfully helped people book theatre, film, tv, and get accepted into graduate school, as well as working as the on set acting coach on the short film MIA, starring, written, and directed by Galia Barkol, and as personal acting coach for Lisa Lampanelli during the development of her off-Broadway play Stuffed.